Anybody else sick of packaged cereal bars? But, they are just SO easy and fast. The concept, a delicious bar packed with nutrients to start your day isn't a bad one. The problem is that most cereal or granola bars on the market have a ton of added sugar and they taste kinda fake. Snack Girl to the rescue!!! So, I have looked a perhaps 100 different granola bar/energy bar recipes and the ones that I like the best feature ingredients that I already have in the house. But, many homemade recipes also have added sugar. In fact, the recipe I used to use (Energy Bar Recipe), has 3/4 cup brown sugar in it. What if all the ingredients were unprocessed and there was no added sugar, honey, or maple syrup? Would you get something that tasted yummy? The problem is that we are so inundated with sugar, that at first a child (or adult) might dislike these because they aren't sweet enough. My 6 year old LOVED these "Cereal Bars" and eagerly ate one for breakfast. I like them because (basically) this is just fruits and nuts stuck together by nut butter and mashed bananas. These are easy to make and store well in the fridge or freezer. And did I mention that they are gluten free and vegan? Whoa! If you like grabbing a bar for breakfast, give these a try. Also, these could make a great snack, but I wouldn't make them as large. I would divide up the batter into 24 muffin cups and cook them a shorter length of time. This way you get a snack closer to a hundred calories - which is a more reasonable amount. If you are gluten-free, please be sure to use gluten-free certified oats. Many oats are processed in the same plants as wheat. Have you tried to make your own cereal bars? SO making some of these! What is nut butter??? These sound really good. These look great! Will definitely be making some! These look fantastic! Must try. Will sun butter work? I have tried making my own bars before, but they were too dry AND too sweet. 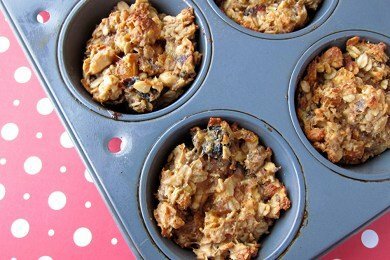 I'll be trying these this week-I'm always eating breakfast on the run-these look perfect! I was hoping that by writing "nut butter" I was including all those nutty spreads that people love such as peanut butter, sun butter, almond butter, etc. Any other ideas? This is such an awesome recipe! I'm totally going to have to try this one soon. Thanks, Snack Girl. Sounds great as I am always looking for new breakfast ideas! Will definitely try, with addition of protein powder. Unfortunately, it's hard to find dried fruits that don't have added sugar, sometimes a LOT of added sugar. We all must remember to READ LABELS!! what about a sub for bananas? A blender will definately not work. There is not enought moisture to keep the nuts and dried fruit from bogging down the blade. You'd be better off putting the nuts in a zip lock baggie and crushing them with a rolling pin and chopping the dried friut with a knife, mashing the banana with a fork and mixing all together. Just a suggestion. Hey Snack Girl, have you ever tried Vegan Overnight Oats? It's 1/3 cup oats, 1/2 to 1.25 cups almonds milk (or milk oc choice), 1/2 tsp vanilla, 1/2 to 1 mashed banana, and 1 tbsp chia seeds (flax seeds and meal work fine too). You stir it a bit then place it in the fridge overnight. In the morning, add desired toppings and eat. Pretty quick too. hi ms katy....... is the oats instant? can i use an ordinary low fat milk? what is chia seeds? any alternatives that can easily found in supermarket? thanks. I'm wondering about the banana substitute as well. @Dorie: I use rolled oats, but I'm sure old fashioned or maybe quick oats work fine too. I don't think steel cut would work though. You could use regular cow milk, it just won't be vegan. I use cow milk whenever I don't have almond or soy milk at my house. Chia seeds are pretty hard to find, I think, but are great for hydration and other goodness. The chia seeds are for thickening up the oats too. An alternative is flax seeds or flax meal. Or just add more banana to thicken it all up!